It is possible that you will never anywhere else find a temple where the custom is of drive-through prayers. Apparently if you pass by this temple on the road and just toot your horn in acknowledgement it counts as a prayer. Of course you still may head up into the actual temple for services. You will find a lot of monkeys clambering over this shrine. It is thought they are the descendants of the macaque monkeys that acted as the guardians of the 16th century priest Nirartha, who founded the temple. The temple has lovely views of the ocean and the beach. Outside, you will also find stalls selling meatball soup and ice cream. Also, visit the popular attractions in the city by following Bali itinerary 4 days. How popular is Pulaki Temple? People normally club together Pemuteran and Atlas Pearl Farm while planning their visit to Pulaki Temple. 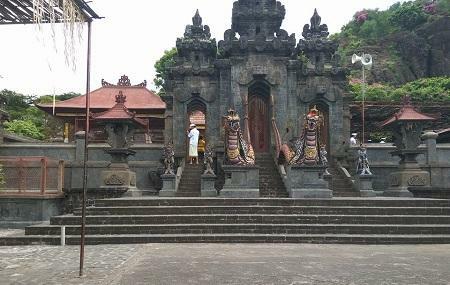 This is Hindu temple located in north west of Bali shore. The weather is a bit hot there and there are monkeys living around the temple site. Those monkeys are protected by the locals there. Visitors should be aware of the monkeys and please keep your belongings safely since they might grab anything of your stuff. Near the beach in village of Pulaki in the western North of Bali. Many monkies arround as same situation in most of temples in Bali. Second visit: I like this interesting place, today is not my first time to visit, the first part my review was written more than a year ago, today was special day because there were some Indo praying, my friends liked to participate and you can see in photos that. The monkeys were cute. I couldn’t enter the temple because of my periods. There is a beautiful sea across the temple. Lovely temple, not so touristic. Beware of the unruly monkeys, it`s their temple. Our guide was very helpfull and spoke english well.